Camping is one of the best ways to vacation for less. 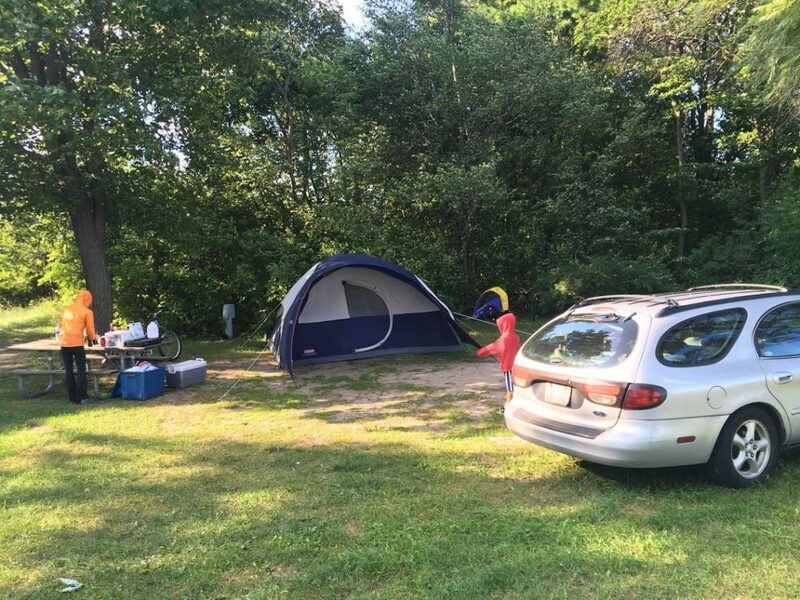 Campsites are very affordable, even in beautiful, expensive-to-vacation areas like beach towns. A campsite offers a true room with a view, more space than a hotel room, and lots of fun, free or cheap activities for families right within the camp ground. Of course there are other ways to vacation cheaply, like travel hacking. And we do some of that. But camping is good for the soul. And it’s especially good for kids. There is a bit of a learning curve to camping. Here are the tips and tricks I’ve picked up over 16 years of tenting it. Grocery pickup: This year, I’m going to do something incredibly un-rugged, and I couldn’t be more stoked about it. I’m doing Walmart grocery pick up for my shopping while on vacation. I think this is a great hack for many travel scenarios. Pluses include: not getting overwhelmed, forgetting a bunch of stuff, and also making unnecessary impulse purchases while trying to shop with three kids and a husband. We’ll save time, and the last thing the kids want to do is go grocery shopping the first day of vacation. While I’m not a huge Walmart fan in general, order pickup is great for these scenarios, and it’s convenient that I can make the order ahead of time, modify it until the night before, and get things like diapers and camp supplies as well. Coffee: if you think I’m overzealous about camping, don’t get me started on coffee! I need it so bad, especially while sleeping in a tent with three children! There are lots of ways to make coffee while camping, but the easier, cheapest, and least breakable option for me is this $7 pour-over product. Walmart, give me some of those #2 filters while you’re at it. If you drink it by the pot, go for a percolator (non-electric) or inexpensive coffee maker (for electric sites). Glamping: on some trips, we have electricity. And let me tell you, we make good use of it. For these trips, we bring a small, old “hot pot” a.k.a. a simple electric kettle. We use this for all our water boiling needs–for tea, coffee (see above), oatmeal, ramen, and even for heating the baby’s bath water. And it significantly cuts down the amount of propane we use on our camp stove. Don’t unpack: We store a camping box or two in our garage, and they’re always stocked with our mobile kitchen, paper products, propane, and other necessities for camping. I also leave little things like a hat, quarters, a deck of cards, a laundry line, a rain poncho, hand warmers, and toilet paper in our duffel bag all year young. These could come in handy on just about any trip so why unpack them? Beach supplies: the beach is so much more fun when you’re well prepared. We’ve always brought a beach blanket (just an old ugly comforter that’s handy in our car all year for emergencies, picnics, and beach days). Since having kids, we’ve added this nifty beach umbrella to our stash and it is sooo worth it. It’s great to have a shady place to retreat–especially for pale folk like me and the kids. We also bring a puddle jumper, a basket of cheap beach toys, and a good mini metal shovel for epic sand digging. Lastly, I keep a swim bag with towels, swim suits, sunscreen, and goggles packed all year. It makes getting out the door (or tent) to swim so much easier. Meal swap: we often camp with friends, and usually team up with 2-3 other families to take turns making meals. This obviously reserves more vacation time for vacationing rather than cooking, without having to go out to eat. But it’s also great because it streamlines grocery shopping. We don’t need to buy a ton of different ingredients for different meals, only to end up throwing away extras at the end of the week. This high chair is great for trips because it folds up small and fits on any table. Packing list: I have a spreadsheet listing all the stuff we need to camp for a week, including grocery items and meal ideas. Though I tweak it from year to year depending on the kids’ ages and needs, it saves time not to start from scratch on my packing list each year. Road trip ideas: we download audio books, music, and movies for the kids ahead of time via library apps like Libby and Hoopla, and streaming services like Netflix and Amazon Prime. We also save by packing some snacks and sandwich stuff to augment the fast food stops (because we have to stop at Bojangles on our way south). Travel hack hotel stops: on our way back we stop at a hotel that we book using hotel points rewards. You can accumulate these by using credit cards, or if you stay at hotels frequently for work and sign up for a rewards program with a particular chain. Excursions: once a year we camp in Florida, and some friends have taken the opportunity to do a less-expensive, one-day Disney visit. It’s not the same thing as an extended stay inside the park, but it scratches the Disney itch while saving massively on accommodations. We have yet to take the Disney plunge, but Neil took our son to Kennedy Space Center last year, and there are plenty of other great tourist options within driving distance. I hope at least one of these ideas helps you on your next camping trip! Wish us luck on our first trip with three kids, and please share your tips and tricks below! These are great ideas! Of course #1 and #2 being the absolute best! I am so excited for you to do the grocery pickup! That honestly adds a half day back into your trip! Exactly! The order is already in the cart! A flannel-backed plastic tablecloth can be used either side up for various conditions. Our card pack is a quart-sized zip-top bag folded over. It holds two decks of cards, six dice, a small pad of paper, a golf pencil, and a tiny cribbage board. There are lots of games you can play with just those supplies. You can even play a version of Uno by naming the face cards as reverse, skip, or whatever. How much do they charge for staying in the campground?